Repentance and Holiness Ministries followers claim that God is angry with Kenyans hence the attack at Dusit D2 Hotel, 14 Riverside Drive earlier today. 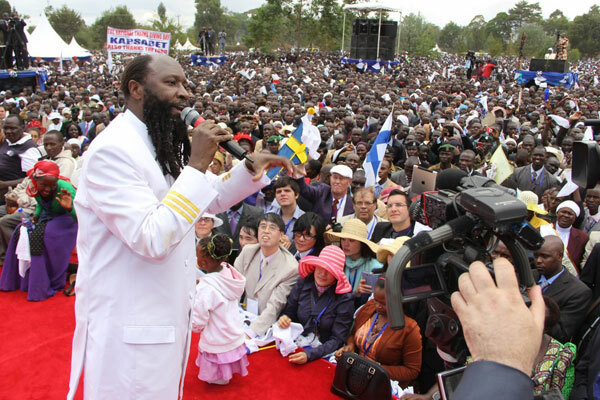 According to a WhatsApp message seen by Kahawa Tungu from one of Prophet David Owuor’s followers, God is angry with Kenyans who have been attacking the “man of god” both online and offline. There has been a trending hashtag on Twitter, #NTVfakeNewsAgain, putting on blast the media house for allegedly spreading fake news about a Muslim teenage girl identified as Khadija who after joining Owuor’s church. The girl, NTV reported went missing shortly after abandoning the Islam faith and denounced her family. This particular Owuor follower is calling for Kenyans, bishops, pastors to abandon their evil ways and repent their sins. Prophet Owuor has in the past claimed to raise the dead, heal the sick, restore sight to the blind and the lame walking. Rescue operations at the Dusit D2 are still on going as more security officers are deployed to the cordoned off area.